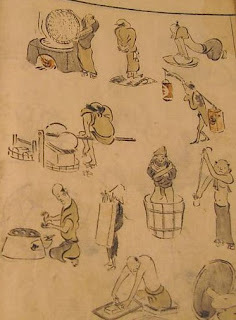 This book or woodblock prints by Kuwagata Keisai (Kitao Masayoshi) was published in 1795 in Tokyo. 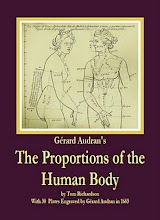 It shows figures in all kinds of actions and has a chart of human proportion at the beginning. it is titled Ryakuga Shiki or Simplified Forms of Drawing or Rough Sketches or Admiring the Spirit and Form of Nature. According to various sources Hokusai was greatly influenced by his work. Very rare. a copy is for sale on Ebay. Search for the book Riaku Gwa Shik on Ebay. 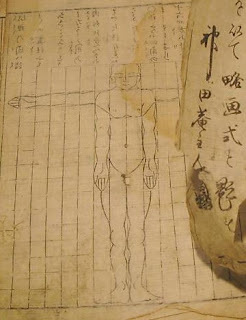 Here is a link to another blog entry by Mark Mason: Kitao Keisai's Abbreviated Drawings. And here is a link to the drawings online from the collection of the Los Angeles County Museum of Art. One of his books was the famous Fish and Shell book. An archive of images from it is available at Degener.com. There are several copies of similar books by Masayoshi at Abebooks.com. Use the search terms "Keisai Masayoshi," or "Gyokai Ryakuga Shiki: Simplified Forms of Drawing Fishes and Shells."